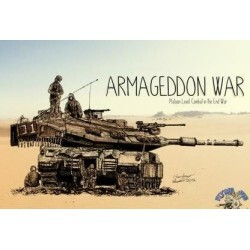 Armageddon War is a platoon level game set in the near future. The first module focuses on the Mid-East, pitting Israelis against age-old adversaries, and a revitalized Russia against the United States. There are no turns, just continuous activations. The intensity of a unit’s close combat modifier is determined by its morale, and when you fire on a unit, it has the option of taking cover, or returning fire. To hit numbers always remain the same, but the number of dice rolled and the effect of hits vary, all represented by multicolored dice and symbols. 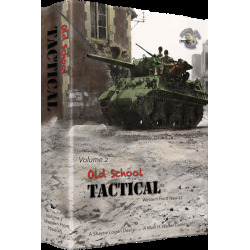 The popular Old School Tactical series returns for its second edition with Old School Tactical Volume II: West Front 1944-45. This iteration of the quick to learn, challenging to master, tactical game introduces the Americans to the series. Fight across the European countryside with M-10 tank destroyers and Sherman Easy Eight Tiger tank destroyers. Pile your powerful rifle squads into venerable M5 halftracks or nail an onrushing armored car with a bazooka. 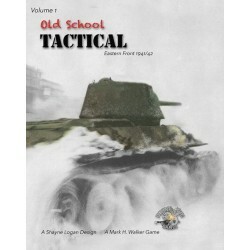 Old School Tactical is a new system for tactical level war-games. This first game involves small unit engagements are fought on the Eastern Front during 1941-42. Players contest each scenario using counters representing the soldiers, guns and vehicles that fought these battles.